I’ll get this confession out of the way – there is something eerie and hauntingly beautiful about dead malls. In 2009, I read a Wikipedia article about Dixie Square Mall. We in the “nostalgia business” know this as the infamous site of the car chase scene in The Blues Brothers. The mall itself has a fairly infamous history due to the aftermath of its closure and the years it was left to decay. Pictures of the mall’s recent history shocked me initially, turning to fascination and interest. 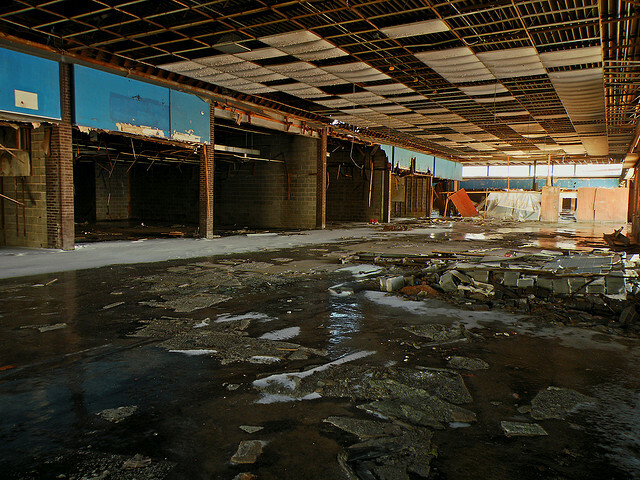 I found myself researching the culture of photographing and filming dying/dead malls in various states of decline. I won’t be taking up this hobby any time soon, but it is fascinating to live vicariously! 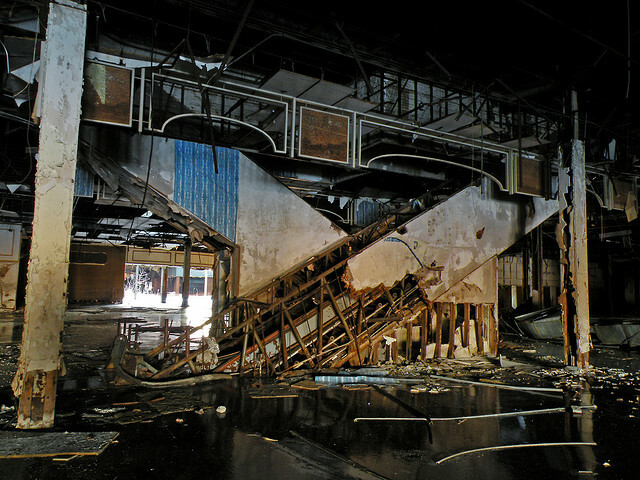 Images of Dixie Square Mall in the most recent years of its long decay (source). It is incredible how something so decayed and reclaimed by nature is so calm. It is simutaneously haunting and beautiful to see these images. Or, beautifully haunting. Columbia, Maryland-based filmmaker Dan Bell explores the fascinating culture of dead and dying malls as part of his You Tube series. His travels have taken him into the dying malls of the United States, including perpetually dying The Gallery at Market East, which I’ve been to. I’m convinced that mall has been dying since the 1980s. Dan doesn’t just focus exclusively on dying malls, but also dirty hotel rooms you’d never want to rest your head in, and even a K-Mart store in its final gasps of life. He combines his narratives with his filmed footage and creates opening credits from bizarre old videos. The soundtracks contain stereotypical mall Muzak. The malls he visits are not dead or closed yet, but slowly dying. They’re overrun by mall walkers and Bath and Body Works stores, but not much else. So, the reason I brought you hear…videos! Compiled for your consideration by Dan Bell, this playlist of his fascinating (for the niche crowd that loves this stuff) series on the culture of dead and dying malls. A Cub Scout 1966 Halloween Party Captured On 8 MM Film!